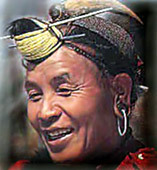 Nishing (Nyishi) - also known as Nishis, is a tribe of Arunachal Pradesh. 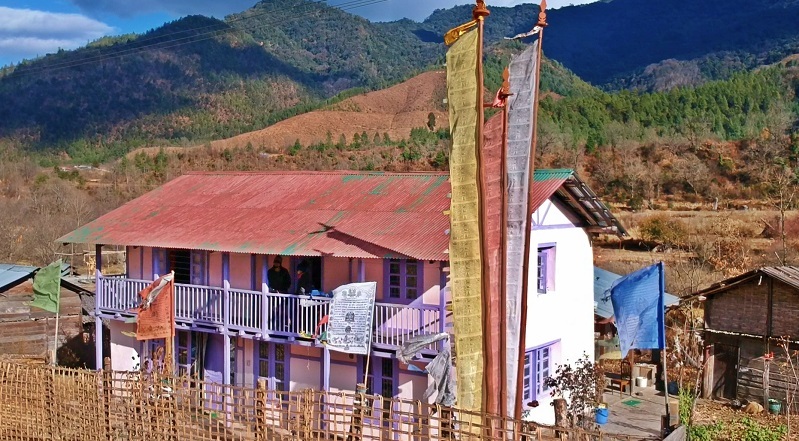 They are the largest groups of people inhabiting the Lower Subansiri district. All Nishis trace their descent from the legendary ancestor, 'Abotani'. Nishis are known for their peculiar, beautiful and artistic dressing sense. 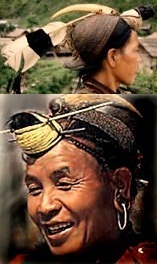 Generally a man wears a neatly woven cane cap surmounted by the crest of a 'Hornbill' beak known as 'Bopia'. Nishing men keep their hair long and tie the hair in a tight knot just above the forehead which is called 'Padum'. The men carry cane baskets on their back known as 'Nara' which is similar to a back pack, and put on cane bands around their waists. One can also see a Nishing man carrying a smoking pipe in his mouth and a long 'Dao' (long bladed knife) known as 'Aoryo'. Like men, a Nishi lady usually carries a neatly woven cane basket for multipurpose use on her back called 'Egin'. The Nyishi women generally wear a sleeveless mantle of striped or plain cloth, its upper part tucked tightly over the breast and enveloping the body from the armpits to the centre of the calves. A ribbon is tied at the waist. A girdle consisting of metal disks and cane garters is worn at the waist. Their hair is parted in the middle, plaited and tied into a chignon just above the nape. Their ornaments include multicolored bead necklaces, brass chains, metal bells, huge brass or silver earrings and heavy bracelets of various metals. Nishing tribes are dependent on 'slash and burn cultivation', which is commonly known as `Jhoom Cultivation`. It is because of the lack of appropriate land for wet rice cultivation. The tribe as a whole is fond of hunting and fishing in which they perhaps excel than any other neighbouring tribes. A handful of Nishing tribes grow dry rice on the sides of the hilly region. Amongst the Nishis 'Opo', which is also known as "Apong", is the only and popular drink. The Nishings belong to the Indo-Mongoloid group of people and their language belongs to the Tibeto-Burman family. Most Nishis are believers of the 'Donyi-Polo' faith, a religion which commemorates their ancestors, emphasizes a belief in many spirits and superstitions, and includes religious rituals which coincide with lunar phases or agricultural cycles. Small groups of Hindus, Buddhists and Christians also exist among the Nishings. Festivals and also social rites and rituals are integrated life of Nishing tribe. The Nishis observe a number of ceremonies in the villages. One of their important community festivals is known as Nyukum, which is performed once in a year in the month of February with grandeur and gaiety. Rekham Pada, Buiya and Roppi are some of the famous folk dances of the tribe.